If you want to introduce a unique touch of the nature inside your home, nothing will do it better than the indoor plants. Most people use Indoor plants for enhancing their indoor decor. However, apart from offering aesthetic benefits, scientists link indoor plants with a long list of benefits such as detoxifying the polluted air, regulating the indoor humidity, and helping in relieving stress. In other words, indoor plants create a welcoming and soothing atmosphere for you to relax when you do not feel like going outdoors. However, to reap the best out of these plants, proper care and arrangement of these plants remain a prerequisite. And yes, it is at this point where you need to get the right indoor plant stand. This stand beautifully displays your inside plants and provides them with the much-needed support to grow healthy. Now the question comes, how do you know the right indoor plant stand for you? Well, it’s pretty simple; it’s all covered below! If you want a plant stand that will offer the best support to your indoor plants, this would be a good option for you. The premium-quality stand is of sturdy bamboo wood that does not wobble ensuring that your indoor plants get the best support. The massive weight capacity of 200lbs means that it can be used for supporting the hefty indoor planters. As you buy an indoor stand for your plants, you should ensure that it will fit the plant pot. And yes, this stand is customizable for use with different pot sizes giving you the freedom to change the plants that are in it more easily. The stand best goes with the Fox and Fern or other round pot sizes with the diameter of between 8-12 inches. The color of an indoor plant stand can define how best it will go with the indoor space. Therefore, it is essential you choose a stand that dovetails with the indoor decor. This stand is available in two colors; the piano black bamboo color and the natural bamboo to allow you to choose the one that matches your interior decor perfectly. The simple design of this unit is what makes it one of the easy-to-assemble models. In fact, it should hardly take more than five minutes to put the stand together. Therefore, the two units should be on their feet within ten minutes after receiving the package. Adjustment of the width is also straightforward for easy swapping of plant pots. It comes with a sleek design. The quality of the stand is great. The sturdy construction adds durability. It may be lighter than most anticipate although it does its work perfectly. 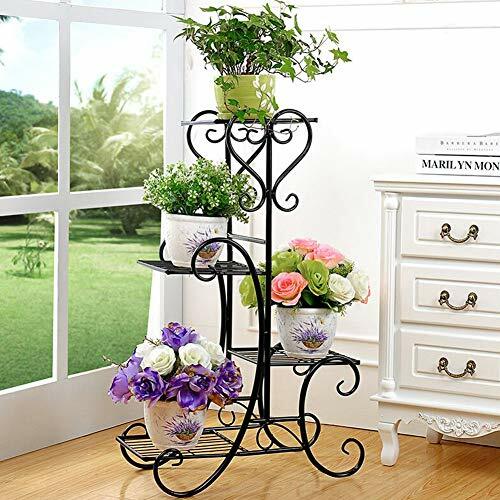 Whether you want it for your balcony, kitchen, bathroom, hallways, or for any other space in your home, this metal plant stand fits in almost any setting. The unit comes with a sturdy metal construction that offers your flower pots with the support that you can trust. If where you live space is premium, this stand should be an ideal option for you. The stand has four layers that hold up to four flower pots without taking an extra inch of your floor space. The four layers mean that it can support different kinds of flowers at the same time to make your interior space more stylish. This plant stand comes with the wrought iron construction that offers strong support to your indoor plants for years to come. The base of the stand is broader so that your beautiful flower plants do not stand the risk of falling. Indoor plants elevate the decor of your internal space, so does this plant stand! The classy curved lines together with the classical European style display adds beauty that you can hardly resist. Also, the corners of the plant are rounded to ensure your safety, that of the little ones and for the pets. Although it has four levels, this stand comes with proper height. This feature makes it easier for you to water the plants at higher levels and exposes them to obtain more sunshine so that they stay in perfect health. It comes with an innovative space-saving design. It is a versatile plant stand. It doesn’t come with the screws for putting it together. 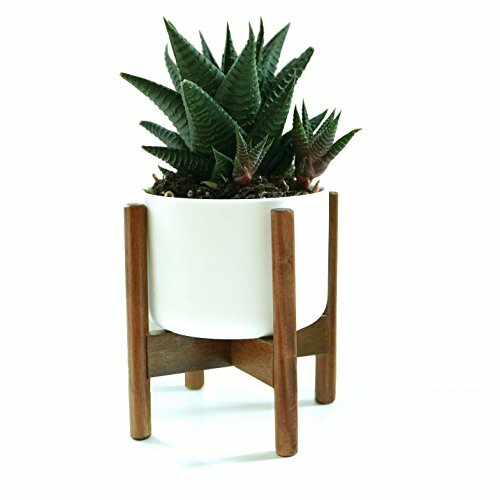 If you are looking for a high-quality stand for the small succulent plants, Fox and Fern Mid-Century Mini Plant Stand is among the ideal options you can consider carrying home. The sturdy stand comes with a white 3.5-inch pot that perfectly fits on the stand. Together with the pot, this stand gives a modern look and goes with most home decors. One thing that most people love about this indoor plant stand is that it is super-easy to assemble. In fact, the design of the stand means that it will fit seamlessly without the need for any tools. Things have just gotten simpler! If you want an inside plant stand that will offer reliable support to your indoor plants, you won’t go wrong by this option. The acacia material guarantees durability to the stand and provides sturdy support to your beautiful indoor plants. The durable acacia stand comes with an elegant design that guarantees to top up the beauty of your interior space. Furthermore, the small size makes the planter ideal for placing on the table. It comes with a 10-inch pot. Could you be looking for an indoor plant stand that will raise your middle or large pots slightly above the ground? Well, it will be a wise idea to consider trying out the Amagabeli 10-inch plant stand. The stand features a sturdy powder-coated iron material that allows you to use it for both indoor and outdoor purposes durably. The premium-grade thick iron wires of this stand give it a large bearing capacity that makes it a perfect option for the heavy and large pots. The four sturdy legs of the stand guarantee to stably support your planters. The support points of this indoor plant stand feature a curved design to stylishly fit in any room. Want to add a unique touch of the jungle without scrapping your floor? 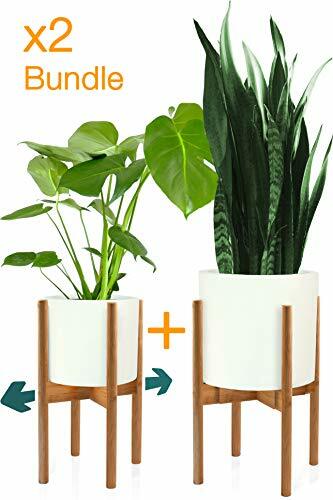 Amagabeli 10-inch indoor plant stand could be what you need. The top-class stand features curved legs that will firmly support your planters without causing damages to the floor. Another fantastic feature about this unit is that it comes with a beautiful scroll pattern at the top. The unique top beautifully holds the planters making a stand a great addition to any patio, balcony, hallways, gardens, or any other room. Since the stand is for the larger planters, it comes with a low profile design to make placing the heavy pots easy. This design also lets the plants obtain more sunshine and makes watering them a breeze- even the children can do it in your absentia. The stand is versatile since it can also be used outdoors. It features a hollow-out design. It does not rust with time. 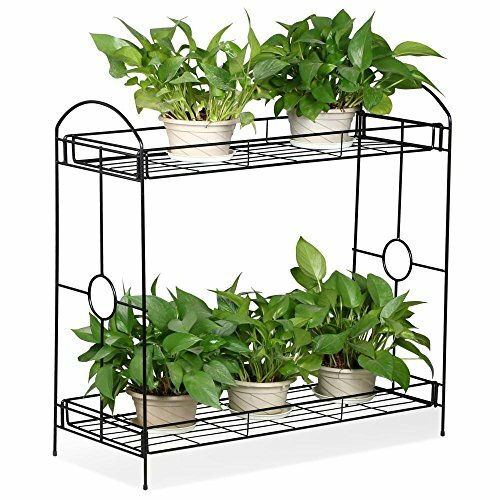 Just in case you need more than one indoor plant stand, this would be a good deal since it offers three stands at the price of one. The three metallic supporting units come in three colors; white, brown, and black so that you can place them in different areas of your home. Tosnail Metal Plant Stands come with sturdy steel construction that guarantees extended durability. The steel construction offers resistance to rust. The rust-resistant feature ensures years of use and makes the indoor plant stand also a good option for the outdoor. The scrollwork at the top of the stand decorates the stand when still offering excellent support for all your potted indoor plants. The beautiful finish makes a stand generally aesthetically appealing making it ideal for the aesthetic enthusiasts. Whether you want to place it directly on the floor or a table, this plant stand is tailored to offer the best support to your planter regardless of where you put it. The versatile design also allows you to use it as a beverage dispenser. The neutral colors are compliment any room. Perfect for the massive clay plants. The unit may warp after using for some time. Ever known that ‘Mkono’ is a Swahili word that means ‘hand’? Well, I believe what incited the name is the fact that this company is dedicated to hand-made work that creates a fresh atmosphere for any home. And yes, when it comes to indoor plant stand, its a no different story; this brown stand is meticulously hand-crafted using a durable beech wood that brings a unique element to your indoor space. This indoor addition can support a pot size with a diameter of up to 10 inches although it can also be used for a pot with a smaller diameter of not less than 8 inches. However, the stand does not come with the pot. Hence, you may have to buy it separately just in case you do not have. The simplicity of the stand allows you to put it together in easy steps without the need for tools. Just stand the unit, set the crossbar in their sections. After you do this, twist the screw and tighten it up to ensure that the unit holds together tightly. Some stands can only support a few kinds of plants. However, when it comes to this stand, it can be used for different types of plants. In other words, you can use it for supporting the leaf fig tree, snake plants, and many other beautiful plant people love to bring in their indoor space. It is a sturdy pot. It is great for use in corners. The stand fits different pot sizes. The color intensities in the two pieces may differ slightly. Are you looking for the perfect gift for the young one? Just get this unit for the toddler and sit back and see the young one develop the passion for gardening. The several items of this stand renders it a must-love option for the young one! It will probably turn the best playing spot for the little member of the family! When playing alone, the little one is likely to get bored quickly. With this in mind, this indoor plant stand comes with a table-top design that allows for multiple child play. The purple tray also fits nicely on the other half of the unit to give the little ones with plenty of surface for playing. The unit comes with all the items that the little ones need to kickstart developing their gardening skills. The unit comes with four flower pots, a tray, two soil disks, a rake, a sifter, shovel, two flowers, and a watering can. All these items have a lightweight design that makes them perfect for use by the juniors. The base of this unit is of a high-quality plastic material. The top-quality material provides the much-needed support to the unit. Also, the base is broader to offer maximum stability to the unit so that it does not tip over when the game is at peak. The plastic items are of high-quality. It is quite low to the ground. Whether you intend to use it for the indoor plants or the outdoors, this plant stand is also versatile hence can be used for the patio, house, garden, or any other place. 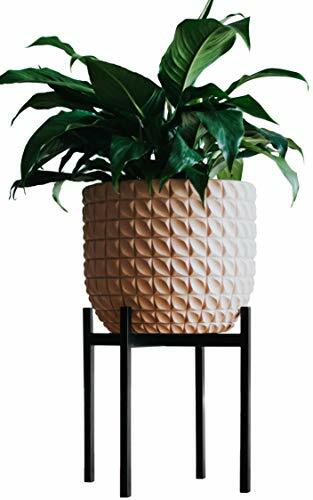 The sleek design of the plant stand beautifully accents any planter and decor. Using an indoor plant stand raises your planters several inches off the ground to prevent soil and water from accumulating under the pot. However, this should not come at the expense of causing damages to the floor. Therefore, the legs of this unit come with rubberized legs at the tip to prevent them from scratching the floor. No more fear that the floor might lose its beauty! This stand comes with galvanized steel construction that offers superior strength for dependable support. The durable construction is reinforced with the beautiful matte black powder coating that resists rust making it an excellent suit for the outdoor pots. 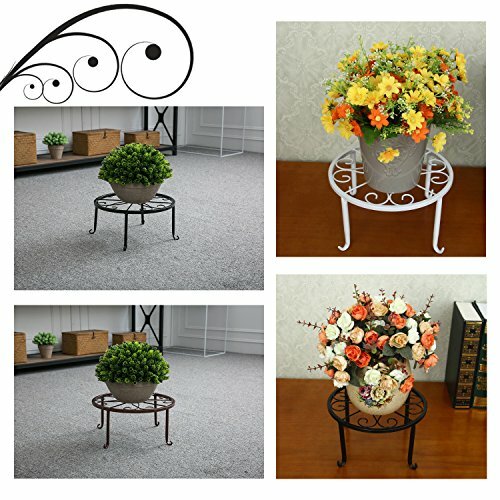 The standard-size plant stand measures 7 inches high with a diameter of 12 inches. This size means that it can support pots with a diameter of 10-12 inches. Furthermore, the compact size makes it a great addition to areas of your home where space may be limited such as in the kitchen and bathroom. It promotes the plant’s health. It comes with assembly instructions. The screw hole might get rusty. When it comes to offering sturdy support to your pots, a metallic plant stand turns the excellent suit. And yes, this stand is of heavy-gauge metallic material with a large bearing capacity that makes it a perfect selection for the more massive pots. The non-wobble stand comes with a hollow-out design that offers ideal drainage to the planter to allow the plants to grow out healthier. This plant stand features high-quality iron wires that offer excellent support to the medium and larger pots. The four supporting points are curved to improve the aesthetics of your house when also preventing the stand from scratching the floor. Want a stand that you can use in almost any area of your home? Settling for this option should be a great idea. The sturdy iron construction pairs with the premium coating to make it a versatile option for any setting. Also, you can use it for holding your sumptuous hot dish. Although it raises your planters from the floor, this unit is quite short. This height makes watering the plants a snap giving you hassle-free maintenance and allows you to monitor the health of the plants easily. They do not require any assembly. They are pretty light than one would expect. This plant stand is large enough to provide enough room for placing more than one planter. The stand also has a higher tier that offers extra space for your other pots without taking an additional floor space, making it a must-have option for those that have many flower pots but with limited floor space. This stand features a heavy-gauge steel construction that gives an assurance of durability. The stand also comes with a powder coating finish that keeps away rust to ensure that the unit retains the beauty for years to come. The two levels of this stand make it among the most versatile options that the market currently holds. Each level can hold up three standard-size pots hence will suit for those that have a deep passion in gardening. Since the stand can hold up to 6 pots, it can easily cause damages to the floor because of the weight. To prevent this from occurring, this unit features rubberized leg tips that help to protect the floor from scraping and scratches. It provides plenty of space. The two-level design means that it may not be the best option for tall plants. A). The Type: Here, you need to decide on whether you want the sitting or the hanging stands. If your indoor space is limited, the hanging type remains the ideal option for you since they do not take floor space. However, if you have plenty of indoor space, the sitting option would be a good option for you. B). The Number of Plants: How many plants do you intend the stand to carry? Ensure that the indoor plant stand you choose can comfortably accommodate the number of plants you expect. C). The Material: Although most of the indoor plant stands are of wood, plastic, and metal materials, you can also get other material types. Ensure that the material you choose can offer perfect support for the plants in the long run. For example, when you are planting lightweight plants, plastic material would be suitable. However, wood and metal materials serve better for the sake of big plants. 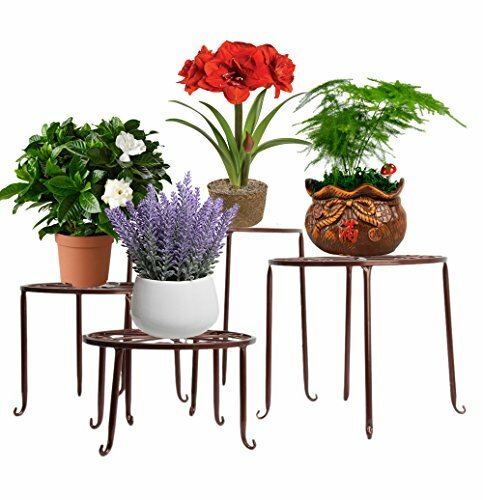 Can the indoor plant stands be used for outdoor? Some versatile options can be used in any area of the home. If you intend to use it for outdoor, ensure that the material can bear the outdoor elements. Can I use the indoor plant stand for any plant species? Some stands work best for the taller plant species while the others are for the shorter plants. Be sure first to confirm that the stand can support the plant you intend to use it for. 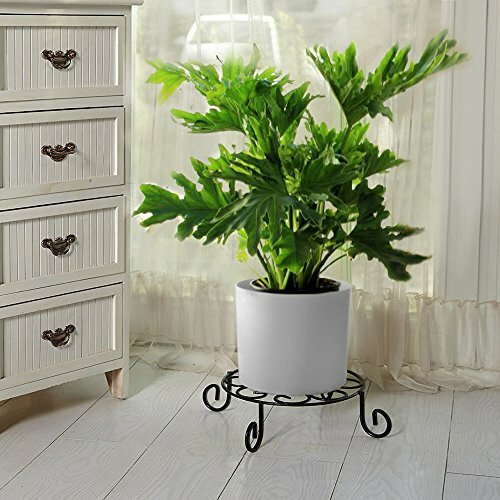 How do I know the best indoor plant stand for me? The level of satisfaction that an indoor plant stand delivers differs depending on how best it meets the anticipated needs. Ensure you choose the one with the features that seem to meet your needs best. If you have indoor plants, choosing the right indoor plant stand is necessary since it will help the plant grow healthier. To select the right option, make sure that you know the type of construction you need, the capacity you intend it to hold, the size of the room, the nature of the plants, and the stability it can offer. With our top reviews, I believe you are now in a better position to sift out the right indoor plant stand.